It's time for Grayling to be a hero. Her mother, a wise woman has been turned into a tree by evil forces. Tangles and toadstools! Lacking confidence after years of being called "Feeble Wits" by her mother, Grayling heads off dubiously into the world in search of help, where she finds a weather witch, an aromatic enchantress, a cheese soothsayer, a slyly foolish apprentice, and a shape-shifting mouse named Pook! A fast-paced and funny coming-of-age odyssey from a Newbery medalist. 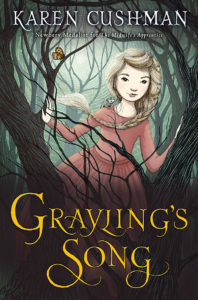 Grayling’s Song is a cute, light fantasy novel for middle grade readers. It reads like something you’d find in the children’s section years ago. The language is a little stiff sometimes and sounds old-fashioned, but I think it adds to the world Cushman creates. This book might not appeal to all readers because younger ones might not like or understand the phrasing and sentence structure, but it will appeal to readers who enjoy fantasy. It’s a great introduction to that high fantasy as it has a wide range of odd characters with magic and strange personalities. Grayling doesn’t have very high self-esteem thanks to her mother constantly calling her “Feeble Wits.” When she goes on a quest to find her mother’s grimoire to free her from the curse of turning into a tree, Grayling doesn’t have much confidence in herself at all. As her journey progresses, she worries about being in charge, making mistakes, and taking responsibility for her actions and the fates of others because of her actions. As the days pass and she faces more and more of her fears, Grayling becomes stronger, both physically and emotionally. This is a spoiler free review, so I won’t spoil the ending for you, but it’s clear by the end that this a story of learning to value your own strengths, learning to value the people with whom you surround yourself, and learning to accept when it is time to move on with your life, away from your parents and away from the people with whom you’ve grown, and embark on your own adventure. I loved the cast of characters, especially Pook, the shapeshifting mouse. There is a lot of humor in this book that will appeal to younger readers, and there is a lot of insight into what a young person faces when growing up and leaving the nest. I also learned that cheese divination is called tyromancy! 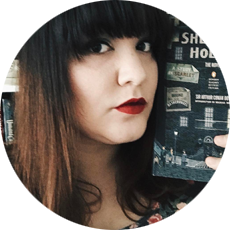 I received a copy of this book from Netgalley in exchange for an honest review!